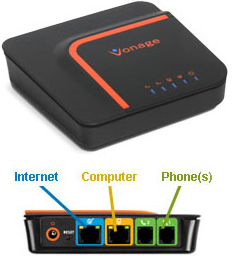 Vonage is one of the leading business and consumers VoIP provider. Currently targeting more small, mid-size and enterprises with s it's unified communication, SIP trunking and API solutions. Vonage is a leading provider of communications services connecting individuals through cloud-connected devices worldwide. Our technology serves approximately 2.4 million subscribers. We provide feature-rich, affordable communication solutions that offer flexibility, portability and ease-of-use for both landline and mobile phones. Our Vonage World plan offers unlimited calling to more than 60 countries with popular features like call waiting, call forwarding and visual voicemail — for one low monthly rate. Our Vonage Mobile app is a free downloadable app for iPhone® and Android™ that lets users talk and text worldwide for free with anyone else who uses the app. Vonage's service is sold on the web and through regional and national retailers including Walmart, Best Buy, Kmart and Sears, and is available to customers in the U.S. (www.vonage.com), Canada (www.vonage.ca) and the United Kingdom (www.vonage.co.uk).